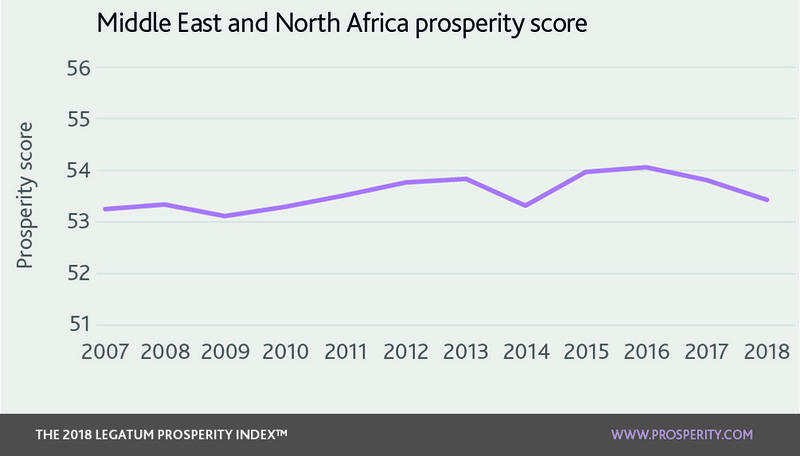 The Middle East and North Africa (MENA) is the 6th ranked region and is one of only two regions to experience a decline in overall prosperity this year, with 11 of 18 countries’ prosperity scores dropping since 2017. The rest of the world, overall, has experienced an increase in prosperity. Despite a wide range of scores within MENA (Israel ranks highest at 37th and Yemen lowest at 147th) the region faces a common challenge in Personal Freedom, where all countries fall outside the top 100. The Middle East and North Africa (MENA) is the 6th ranked region and is one of only two regions to experience a decline in overall prosperity this year, with 11 of 18 countries’ prosperity scores dropping since 2017. The rest of the world, overall, has experienced an increase in prosperity. Despite a wide range of scores within MENA (Israel ranks highest at 37th and Yemen lowest at 147th) the region faces a common challenge in Personal Freedom, where all countries fall outside the top 100. Despite an improvement over the last year, Safety and Security has fallen over the last 10 years. There has been a rise in the number of refugees coming out of Libya and Iraq in the past year, and the region has seen a sustained decline in national security. This is unsurprising given the proximity of many countries to Syria. Business Environment has experienced a clear and consistent rise since 2007, where various countries have improved access to credit and ease of starting a business. MENA as a region has a disproportionate number of countries that have declined in this pillar over the last 10 years. In Health, the level of obesity in the adult population rose in every MENA country this year, with the largest risers being UAE, Algeria, and Egypt. This is already a significant issue in MENA, with the percentage of the population classed as obese ranging from 26% to 38% across the region (excluding Yemen at 17%). Despite improving across most pillars, Turkey saw a large drop in Social Capital this year, with large falls in the number of people saying they help strangers, the number of people volunteering, and the number of people giving donations. As the government has become more autocratic, Governance and Personal Freedom have declined. Tunisia worsened in Personal Freedom this year, with fewer citizens satisfied with freedom, and the largest drop in the government religious restrictions score. Lebanon saw a large fall in its Safety and Security score this year, due to a large increase in deaths from conflict. It also saw falls in Governance, Business Environment and Personal Freedom. Whilst Oman ranks 52nd for Business Environment, it has made the second largest improvement in the ease of starting a business over the last 10 years in the region. Israel ranks 22nd in Governance and it is the only country in MENA to receive the top score for political rights from Freedom House, which is a measure of electoral process integrity, political pluralisms and participation, and the functioning of government. It also comes 24th for voter turnout, at 76% in the most recent elections, and 52nd for the number of women in Parliament, at 27.5% representation. 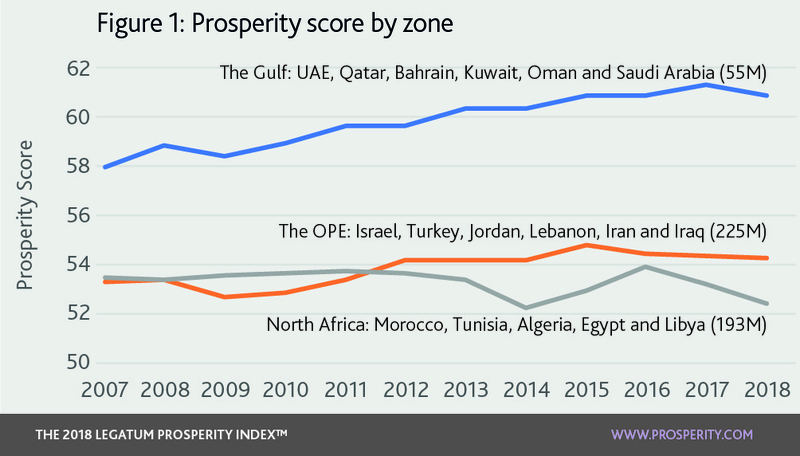 Prosperity in the region as a whole has stagnated over the past 10 years, but this veils the differing fortunes of three distinct zones within MENA. The countries of the Arabian Peninsula, excluding Yemen, make up the Gulf area that is broadly prosperous, with a rate of improvement close to the world average. The countries of North Africa and those of the Old Persian Empire, stretching from Turkey in the west to Iran in the east, had similar levels of prosperity in 2007. More recently they have started to diverge, with North Africa’s prosperity declining over the past decade. The Old Persian Empire countries have experienced a slight improvement since 2007, but at a lower rate than that of the rest of the world. The basis of prosperity for the countries of the Gulf has been provided by good ranks in Safety and Security as well as relatively strong economic foundations. The area is also particularly successful in Health, outperforming many countries in the world. However, institutions are weak, with poor Personal Freedom (a region-wide phenomena) and shortcomings in Governance, due primarily to almost no democratic participation in politics. Furthermore, five of the six Gulf countries are in the bottom 50 worldwide for press freedom. In Oman for instance, there have been numerous cases of activists, intellectuals and citizens prosecuted for expressing non-aligned views in print and online media, and the recent Khashoggi killing has reinforced the lack of press freedom in Saudi Arabia. Civil liberties and freedom of expression is restricted with no country in this zone scoring better than five out of seven in the Freedom House civil liberties indicator (where seven is worst). However, the region, which contains a lot of immigrant workers, scores well for social tolerance. For example, the UAE is second globally for tolerance to immigrants. Five of the six Gulf countries are in the bottom 50 worldwide for press freedom. 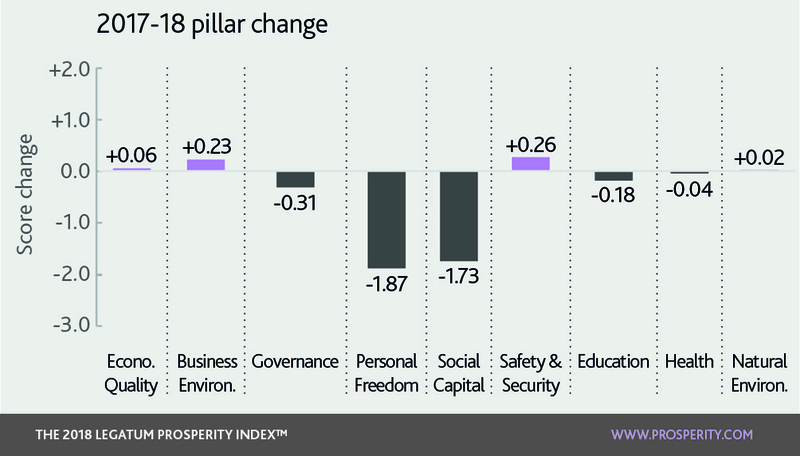 The economic foundations for Prosperity have continued to improve, with the Gulf area open to reform. In the 2018 World Bank Doing Business report,Saudi Arabia is ranked as the 2nd best reformer out of high income countries.3 The UAE has also been one of the biggest risers in ease of starting a business, rising from 81st to 45th in the last 10 years. With the exception of Israel, the countries of this zone are significantly less prosperous than the Gulf and are increasing their prosperity at a lower rate. They have weaker Safety and Security, weaker Governance (due to lower rule of law and worsening government integrity) and weak economic foundations. This zone has a fundamentally precarious state of national security; other than Iran its countries all border Syria. The zone has a large number of deaths from conflict, with Lebanon having the highest number in the Index. Terrorist attacks are frequent across the zone, with their prevalence worsening in Turkey in recent years, placing it 135th for this indicator. Turkey is the main contributor to this zone’s falling Governance score. Erdogan’s attempts to transition the country away from democracy has led to its democracy level falling from 69th to 128th over the past 10 years, due to higher reported levels of judicial corruption. Iraq by contrast now ranks 80th for its level of democracy, up from 145th in 2008. It has improved from 147th to 138th in the overall Governance rankings in the same time period. This sub-region has weaker economic foundations than the Gulf and lower economic growth. Unemployment rates are higher – over 10% higher than the Gulf in Iran, Jordan and Turkey. Investor protections are lower and this is coupled with greater difficulty in starting businesses. It is notable that the two oil-rich nations in the OPE, Iran and Iraq, score worst for Business Environment in the sub-region. The five North African countries are all in the bottom 50 for global prosperity, and all but Morocco have decreased in Prosperity over the past decade. Unstable Governance and the worsening of Safety and Security in the area has disrupted growth in Prosperity. In particular, Social Capital is weaker, and worsening (see our regional analysis in last year’s report). Education and Health are also poor. The consequences of the Arab Spring have not improved Governance and have worsened the Safety and Security of the zone, with Libya erupting into civil war in 2014. Egypt experienced a fall in its rule of law as it slid back to autocracy. Democracy in Tunisia was not accompanied with an improvement in government performance and the rule of law is now weaker there than before the Arab Spring. As a result of conflict in the region deaths from conflict and terrorism have increased, primarily in Libya and Egypt. Four of the worst six countries in the MENA region for Health and Education are in North Africa (the others are Iraq and Yemen). Although there have been few changes in most measures, indicators of wellbeing have worsened among North African countries. For instance, more people are reporting sadness in all countries compared to a decade ago. Satisfaction with education has also decreased and parents perceive their children as learning less at school.